We are proud to announce that the first release of the AwesomeCloud Online Portal is now available to our channel partners and cloud resellers. We have completed our initial round of Q&A testing and the portal is ready to roll. The release of the self-service online portal coincides with our release of App Controller for Virtual Machine Management and our web-based firewall portal for Cisco and Fortinet users. Suffice to say, we have a variety of web-based tools so that you can better manage your white label cloud resources. While our partners can currently manage their virtual machines (start, stop and restart) through the use of App Controller for System Center 2012, the online portal provides self-service quoting functionality for the purpose of providing your sales team with immediate access to pricing quotes. With the new AwesomeCloud online portal, you will be able to quickly generate precise à la carte pricing quotes for the white label infrastructure, disaster recover, and software licensing solutions that you offer to each of your clients as an AwesomeCloud partner. You will also be able to save pre-defined specs for future quotes to further expedite your day-to-day operations, which will help you spend more time on selling and less time on administration. Future online portal releases will include billing integrations, virtual machine management (currently accomplished through APP Controller), and, most importantly, the ability to quickly provision new white label cloud services for your clients. 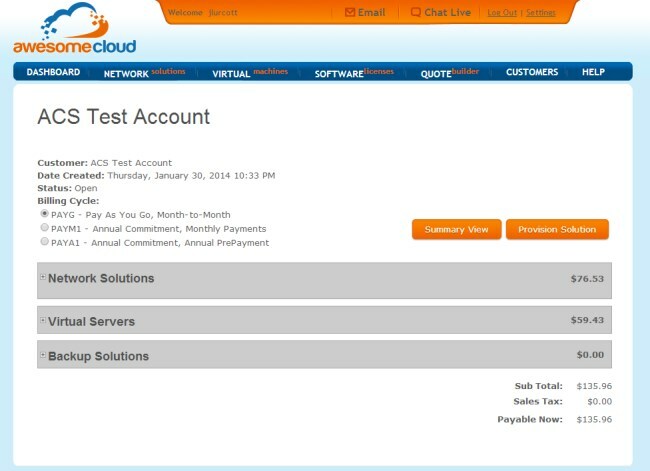 If you’re an AwesomeCloud partner, you will soon receive an email with the above information. We will then follow-up with you to confirm that you can access the portal. If you have any questions regarding the rollout of the AwesomeCloud online portal, please contact us by emailing your account manager, John Donnelly, or by dropping us a line over Twitter with the @awecloud handle. If you would prefer to speak with me directly regarding the portal, please email jcoburn@awesomecloud.com. Prior to founding Awesome Cloud Services, Jess was an Electrical Engineer with Motorola. He was a member of a research team that developed next generation digital communications systems. In his spare time, you’ll likely find him at the grill or in front of his smoker getting ready for some lip-smacking ribs to enjoy with his wife and two kids. Channel Partner Case Study: BCG Systems, Inc.